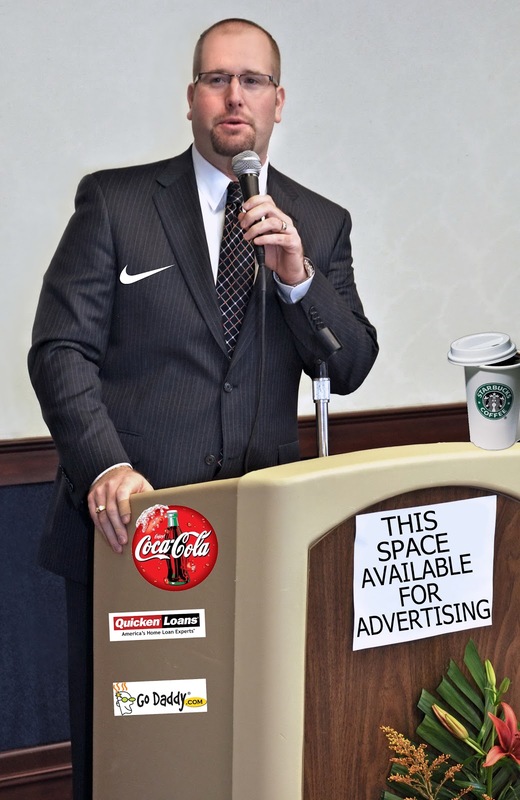 The Rabbi with a Blog (Rabbi Jason Miller): Rabbi As Pitchman? Advertising is all around us. It's become impossible to find an event or location that doesn't have corporate sponsorship attached to it. Product placement has become the norm in movies and TV shows. And it seems like everyone has an endorsement deal these days. On Comedy Central's "The Colbert Report," host Stephen Colbert begged Apple for an iPad 2 and then become a shill for the company. He also branded his presidential run "Hail to the Cheese: Stephen Colbert Nacho Cheese Doritos 2008 Presidential Campaign Coverage." After winning a Peabody Award, he thanked Doritos for its support. NASCAR drivers (and their cars) and pro golfers look like walking billboards. Celebs are seen carrying their Starbucks cup with the label facing the eager paparazzi for free publicity. What's next, tattoo advertising for NBA basketball players? Yes, in fact a candy company once approached the agent for the Portland Trailblazer's Rasheed Wallace to inquire about buying space on his flesh. Apparently there was still some open real estate for a billboard on his already heavily tattooed body. Earlier this year, filmmaker Morgan Spurlock lampooned the burgeoning business of product placement. Spurlock even sold the naming rights to his movie: "Pom Wonderful Presents: The Greatest Movie Ever Sold." Everything is for sale. You can go to a sporting event in an arena named for a corporation, receive a giveaway sponsored by another corporation and then watch the halftime show generously underwritten by yet another corporation. It seems like everyone's a pitchman today. Anyone can hawk a product or drop the name of a corporation for financial gain. But what about clergy? Can religious leaders sell out too? Er, I mean can rabbis and priests get in on this deal? For instance, can rabbis mention a few products in a sermon and get paid for it? Can I insist that the wine used at the wedding ceremony be a specific brand and then make certain the photographer catches me pouring from that bottle? What if rabbis started wearing Nike lapel pins on suits? Or if rabbis let the congregation know that the flowers decorating the pulpit are from 1-800-FLOWERS and were delivered by Fed/Ex. Perhaps before services begin, the rabbi could remind the congregation to please silence their Apple iPhones on the Verizon network. Perhaps a rabbi could even sell space on his blog to a mortgage company? What got me thinking about these endorsement deals for religious leaders was when I viewed the viral video of Pastor Joe Nelms of Family Baptist Church delivering the invocation at a NASCAR race last week in Tennessee. The pastor wanted to give a prayer that would be remembered so he borrowed from Will Ferrell's memorable grace before the meal in the movie "Talladega Nights." In the movie, Will Ferrell gave thanks to the various fast food companies that had provided food for his family's dinner and then, according to his endorsement deal, he mentioned Powerade. What people will remember most about Pastor Joe's prayer are the humorous lines in which he thanked the Almighty for his "smokin' hot wife and two kids" and then borrowed NASCAR Hall of Famer Darrell Waltrip's trademark phrase in the closing of his benediction: "In Jesus' name. Boogity, boogity, boogity. Amen." However, the Baptist pastor also managed to mention several sponsors of the NASCAR race that night including Dodge, Toyota, and Ford, as well as Sunoco Racing Fuel and Goodyear tires. Pastor Nelms claims he wasn't compensated for mentioning those companies, but it does raise the question of whether religious leaders are missing a lucrative opportunity. I'm not the first to think of clergy as pitchmen either. After the death of famous pitchman Billy Mays, there were rumors that Orange Glo International, makers of OxiClean, was interested in hiring Pastor Rick Warren of the Saddleback Church as the new commercial pitchman for their well-known laundry stain remover. Maybe these clergy endorsement deals are already taking place. Rabbi Shmuley Boteach, writing in the Huffington Post today about his eldest daughter's upcoming wedding, managed to drop the name of both the caterer and country club where his daughter's wedding will take place. Was there a behind-the-scenes deal in which promises of a mention on HuffPo would translate into discounted fees for the wedding reception hall and catering? Who knows. He just might be on to something. "Please join us on Sunday afternoon for our monthly book club discussion. We will discuss a new book published by HarperCollins, which is available for purchase on Amazon.com. We'll enjoy Snyders of Hanover pretzels and drink icy cold soft drinks from the Coca Cola Company. The book club will take place at the Feldmans' new home, which they recently purchased with a shockingly low rate mortgage from Quicken Loans." But your next contract with the Congregation would require a 50-50 split of revenues for placements from the Congregation's bema. I think all prayers should end in boogity, boogity, boogity, amen. It has such gravitas. Boogity Boogity Boogity... Kein Yehi Ratzon! Perhaps Conservative Rabbis should get paid an advertising fee by the treif establishments that they eat veggie/dairy in that in turn causes their congregants to eat their also in great numbers. Not that Conservative laypeople don't by and large "eat out" to begin with but places that the Rabbi goes generally get an even bigger turn out. In some communities places like the Cheeecake Factory have reputation for being popular among the Jewish community. Your comment is perfect because I was just having this conversation with another Conservative rabbi today. Since I own a kosher certification agency, I field a lot of calls from self-identified Orthodox Jews who ask me questions about my standards and the places/products that Kosher Michigan certifies. I can't even begin to describe some of the ignorant questions I get from Orthodox Jews about kashrut (both BT's and FFB's). 1) Is the pizza glatt? 2) Are the bagels glatt? So, now you leave a comment complaining that Conservative Jews are eating dairy and veggie at "treif establishments." 1) At least here in the Metro Detroit Jewish community (the community I'm most familiar with), it is common to see Modern Orthodox Jews eating in non-kosher establishments. Even Orthodox Jews who wouldn't identify as "Modern" will go to a Coney Island restaurant (known as a diner outside of Michigan) and get a Greek salad. I've asked some of those Modern Orthodox Jews if they eat the complimentary *grilled* pita bread that accompanies the Greek salad. They answer in the affirmative. All of a sudden they're not so worried about: a) Pas Yisrael, b) Bishul Akum, or c) The bacon that was grilled on the same grill as their pita bread! 2) You're complaining about Conservative Jews eating veggie and dairy in non-kosher restaurants, but for many Conservative Jews that's much better than the alternative, which is eating treif in non-kosher restaurants. So, if we're all climbing madregot (steps) in an effort to observe more mitzvot, I think you might want to reconsider your argument. Ultimately, I remind you of an important fact. For every Jew who is all high and mighty about his "Super Frum" level of personal observance, I can find another Jew who will look down on him because he's not observing all the chumrot (strictures) that he follows. In other words, there's always someone who can out-Frum you!! If it makes you feel better to find Jews who aren't as religious as you, then zei gezundt. What ever gets you to sleep at night. For me, I'm in the business of trying to get more Jews to increase their observance and performance of mitzvot, so I try to encourage Jews to do more rather than rant about what they're not doing right. I agree with you that we should be more concerned with encouraging greater mitzvah observance rather than worrying about what others are doing wrong. So if we want to encourage observance, shouldn't Conservative rabbis be setting a better example for their congregants by not eating pizza out? Also, if one's personal standards are that it is OK to eat veggie/dairy in a non-kosher establishment that is their busisness, but I think it is disingeneous for them or rabbinical figures to convince them that it is the same as kosher. I know of many people who view certain establishments as being "more OK" because their local Conservative rabbi dines there, in effect, becoming an unofficial pitchman for that place. Your argument about there always being some one who can out frum you is way off the mark. So what if there is someone who keeps more chumras than me? I'm talking about halacha. Sure I don't eat only pas yisrael and I know people who do, they would never say that I'm eating treif. Keeping kosher is halacha not a chumra or a minhag. All Jews are required to keep kosher. Last time I checked, the C movement does not (officially) subscribe the the Reform and Pauline "personal choice" philosphy of whatever mitzvah work for me. Maybe my intial post was too harsh so I'll rephrase. I know of many communities where the local C rabbi has become a pitchman of sorts for treif restaurants, resulting in a disproportianate amount of Jewish clientele. I don't think it is appropriate for a Conservative pulpit rabbi to eat veggie/dairy/fish in treif establishments in communities where a kosher altnerative is available. From the other side of the argument, kosher certification organizations do this too. There are so many small eco-conscious vegetarian, vegan, or organic firms out there which definitely are kosher, but would never get certification because they can't afford the fee for the certification. Thus, Jews who keep strict kosher will never buy these products, making it even more difficult for them to get any chance at becoming certified and expanding operations and distribution. In this way, it becomes that much more difficult for observant Jews to practice a healthy, eco-conscious lifestyle. If that's not endorsing, I don't know what is.